Kimberly was born in Syracuse, New York where she spent her childhood and graduated from Bishop Ludden High School. She attended Lynn University in Boca Raton and worked for Vintonio's of Boca. She then relocated back to Syracuse to manage her family business, G.B. Stringer Hardware Inc. In 2001 Kimberly began her real estate career with Prudential First Properties. Kimberly earned the shooting star award her first year. After spending many a cold winter in Syracuse, she decided to move to Vero Beach in 2004 to be closer to her family. She worked for Michael Thorpe Real Estate from 2004-2010 where she was a Top Producer each year she was there. In 2010 Kimberly came to work for Dale Sorensen Real Estate Inc. Kimberly had a record year in 2015 for sales and has been a Top Producer for DSRE the last 3 years. 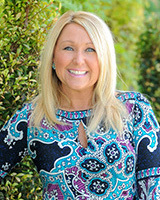 Kimberly enjoys working with buyers and believes a positive attitude and daily gratitude are her biggest assets. During her free time Kimberly is a Catechist at Holy Cross Church and volunteers at HALO in Sebastian. She is the proud mother of a 17 year old and enjoys traveling, swimming and spending time with her 2 dogs. Kimberly enjoys outdoor living year round in Vero Beach. Her favorite activities are bike riding, swimming, bridge walking, gardening and scuba diving.